Dexter & Gina moved to the safe house!! 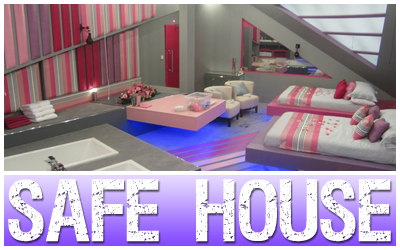 Dexter and Gina have been voted in to Big Brothers Secret Safe House by the public. Tonight we watched as Emma 'evicted' both Dexter and Gina in a fake double eviction and then Big Brother explaining to them in the Diary Room that the public had actually been voting to send them to the Safe House. They have now entered Big Brother's luxury Safe House where they will listen in to everything their fellow housemates say and watch everything they do, they have also both won immunity from next week's nominations. Are you happy with the results of tonight's fake double eviction? let us know in the forum. So its Gina and Dexter. Yay. I'm really happy with this outcome. Will make for excellent viewing, to say nothing of the uproar when they go back in! Plus next weeks nominations are wide open and will be very interesting. Yes 100%. They needed immunity the most. Yes, I have surprised myself. I thought it would be more fun the other way round, however the immunity for WOLFY and Dan would be a step too far. And loving WOLFY hearing all those boos. Best part was that this is NOT the result the producers' want, but they couldn't do anything about it even though they tried! very pleased with the way they handled being evicted as well it shows a lot. I loved Dexter's reaction. I wanted to give him a massive hug. I'm liking him more and more. Yes, although I'm hoping it's not their downfall, they're going to end up saying nasty things to the screen & may get big-headed, I really hope not though. It was the right choice from these two pairs in terms of entertainment value, eventhough i don´t particularly like Gina. I´m warming to Dexter however. Tonight was the best show in years . Why did you post that here Twitter Robot? Have you been drinking? Its what I voted for, so yes. Plus it leaves the way open for Wolfy to be thrown out next week. Every episode this week now is going to be filled with her moaning though. I'm just climbing back down from the ceiling, that was some head rush! Murray through to the final and Dex & Gina in the safe house.